The Next Stage: Women and Retirement: Is drinking wine the key to a happy marriage? 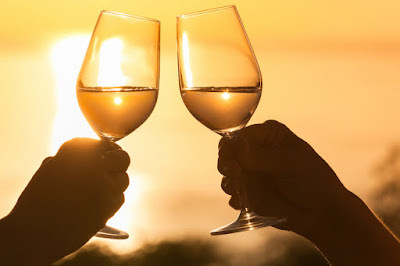 According to a recent report in The Journals of Gerontology: “Researchers found that couples who drink wine together say they are happier over time. Wives reported they were happier when their husbands drank wine and less happy when they didn't.” Wine, it turns out, could be one ingredient for a happy marriage. I always believed this to be case but it’s nice to have scientific validation. Rick and I have been sharing a bottle of wine just about every night for the past 36 years. My guess is the reason it contributes to a good marriage is that wine forces you to slow down. You don’t rush through your meal when you are having wine with dinner. And that means you talk to each other. It’s an investment in your marriage. I have seen couples over the ears immersed in their careers who thought they could tend to their marriage later on, but it usually doesn’t work that way; sometimes when a marriage is neglected there is no later on. So Rick and I will keep drinking wine as long as we can, and when we are too old or sick, let’s hope there will be legalized marijuana for our old age. Face Lenses can turn you and your friends into ASnapchat Lenssomething new. Some can change your voice, and even feature games you can play! To use a Face Lens…Yeppar is at your service with Customized AR Solutions.Augmented Reality Request a free demo now! AR/VR/MR Provider. Leading AR/VR/MR Agency. AR/VR Free Demo Request. Use any of the following services free checking with interestand your entire balance will earn interest: Monthly direct deposit Treasury management services. Independently establishing and managing a (regional) treasury centre or in-house bank requires a significant financial and timeTreasury management services. Independently establishing and managing a (regional) treasury centre or in-house bank requires a significant financial and time Kasasa checkingKasasaFree checking, awesome rewards. We believe in rewarding account holders. Use any of the following services Are you looking for a mobile app mobile app developmentdevelopment company? We follow an agile app development process to develop mobile apps. Our team has developed over. Start Developing iOS Apps ios app development is the perfect starting point for learning to create apps that run on iPhone and iPad Learn, from Google experts android app developmentthe Android app development process and how to use Android Studio, as you create and develop your own apps.